The Cavalier King Charles Spaniel has roots that are centuries old. Their likeness was seen in paintings that date back hundreds of years from France, Spain, England and Scotland. Normally, they were surrounded by their well-to-do families. Back then, the gorgeous Cavalier King was a staple of royal courts and noble homes. 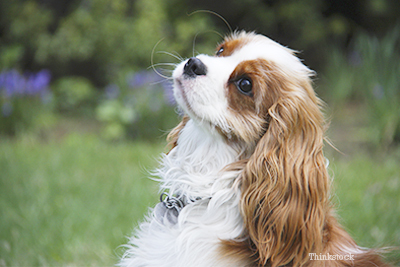 The Cavalier King Charles got its name from England’s King Charles I and his son Charles II. When King Charles I was executed, his toy spaniel was at his side — Cavaliers are serious about loyalty. The Cavalier King Charles Spaniel was recognized by the American Kennel Club in 1995. Weight: 13 to 18 lbs. What’s the Cavalier King Charles Spaniel like? The Cavalier is a friendly, easygoing dog who is full of cheer! He may be small but he has plenty of love to give and is a great companion dog; he’s often fond of relaxing in your lap. If you’re looking for a watchdog, the Cavalier is simply not for you; he is trusting and friendly to every person he meets. Even though he does love nights on the couch, he doesn’t mind a nice stroll through the park every now and then. He would be a perfect fit for the right family. Cavaliers are pretty easy to train, especially if you start the training sessions very early. Some Cavaliers can get a bit stubborn so always use positive reinforcement with firm and consistent training. Of course, treats are an excellent motivator. Cavs do have a couple of habits you may want to knock out early such as licking, loud barking, and digging. You may think, because of their long silky locks, that Cavaliers are hard to groom, but it’s quite the opposite! Since their coats are fairly light, you’ll be able to get away with brushing only weekly to prevent any tangles or mats. It also helps to remove any dead hair before it ends up on your furniture, because these dogs do shed. A condition that clouds the lens of the eye and in some cases can lead to blindness. A disorder that causes a lack of ability to produce tears resulting in a dry cornea, if not treated blindness could occur. It’s also known as "neck scratcher's disease;” a common sign is scratching of the back of the neck. It occurs when the spinal cord, near the brain, develops fluid-filled cavities. A knee condition where one or both kneecaps can accidentally slip out of place. It’s also known as "glue ear,” and has been increasing among the King Charles. It’s a viscous mucus plug that fills the dog's middle ear. The Cavalier King Charles Spaniel is great with children. The Cavalier King Charles Spaniel doesn’t need extensive exercise. The Cavalier King Charles Spaniel is best suited to a family that will be home often. The Cavalier King Charles Spaniel should always be walked on a leash.